Do you have a word for the year (My One Word)? You may or may not have heard of the alternative to resolutions. The problem with resolutions? They are easily broken or forgotten. One word? It guides you through the year just like the star guiding the Wise Men. My word last year was TRUST. I needed it, more than I knew last January. I learned a lot of lessons. Focusing on TRUST opened my world, helped me realize I could trust my instincts when it came to situations, and helped me develop new relationships. In terms of “my one word” history, it was a stellar year. But as I write this, the year is ending and I don’t want to let my word go. It’s been so good for me. I don’t want to start over! But if we ignore beginnings and endings are a part of life, well, our new word is STUCK. January is the time I look to getting out of a rut. But sometimes I don’t try as hard as I should and end up squandering a shiny fresh start. That’s when the restlessness, frustration, and trapped feelings set in. The words to the Philippians, a reminder God created me, began work in and is with me still, get forgotten. I’m trapped like a fly in a spider web (pardon the imagery). One way I work myself out of a rut (especially the writing rut or not trying new things) is do something crafty, a project with a definite beginning and end. It’s easy to put my new word on a chalkboard sign, create a little diorama or design a birthday card. My mind is freed up to pray and I remember God gifted me with creativity. Somehow starting and finishing something small is often the catalyst for those bigger projects and changes I’m scared to step into. EXPAND is my 2016 word of the year. It’s freaking me out. Because there’s no catalyst bigger than God reminding me sometimes I need expand my horizons, views, contacts for God to complete that good work in me. So here I am, getting ready to begin a new year in faith, trusting God’s word and my word see me through. 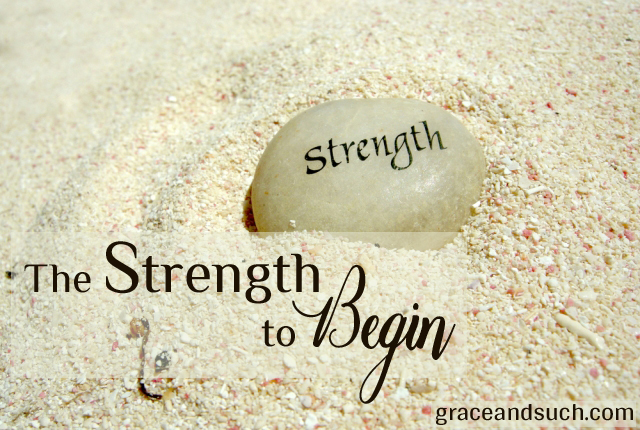 May you have the courage to begin, the strength to begin again, and the knowledge God is with you in this New Year. Great word. The way I see it, trust is in there with expand. You really aren’t giving up any thing. Yep, I am building on it. But it took me a while to come to that realization. Expand. I like it. Not sure what my word is, but expand could cover it, because I’m trying to do new things that push me out of my comfort zone. Thanks for this encouragement! So glad EXPAND speaks to you! May your year be one of discovery! Stuck has been my word too many times and I don’t like it. Expand is a great word! I’ve been stuck too. I’m not saying it’s going to be easy but I’m getting unstuck this year. Good word, Sis. Mine is strength. i think it’s related to health but then again, God takes me in funny directions when I think I know where I am going all by myself! Expand on, girlfriend! Thanks for the encouragement, Diane! Expand- what a great word (except for when it’s my waistline). I usually have a weekly mantra to keep me focused, but it changes each week. This week it is- stay the course.